A Mastercard Black Card is definitely for decision makers. So have you decided yet? Mastercard Black Card. This beautiful card, launched in 2008, is a master in its class. Made from luxurious stainless steel with carbon, it also has a patented design. With this card comes the luxury of high spending limits and amazing benefits. What is most appealing is the fact that cardholders are eligible for the MasterCard Priceless. A service which offers invitation-only customised benefits that the company describes as a once-in-a-lifetime experience. Many wealthy people in the world have a high credit rating from managing their finances well. Due to their wealth, these people experience the unique opportunity of owning this special Card. Large corporations such as CitiBank or American Express also have their version of the black card. The annual membership of the black card is $495. Many consumer credit cards today cost less than $100 a year, and some are completely free. Unfortunately, the chances of an average income earner owning a MasterCard Black Card are virtually nil. The Black Card, Titanium card and the Gold card are part of a family of cards. Between the three you get unique benefits. Some of these are Concierge services, Priceless and VIP travel. Concierge Services – this is a 24-hour service where you receive personal service on making travel arrangements, bookings to theatres, concerts or restaurants, etc. Luxury Gifting is also part of this programme. Priceless – this benefit entitles cardholders to enjoy exclusive experiences all over the world such as Pro-Am tournaments for example. VIP travel – the VIP travel benefit ensures cardholders of discounts for over 3,000 hotels and lounge clubs, etc. and gives the card holder access to airport lounges around the world. The Master Black Card is indeed an incredible card to own – it is one of the few high-end cards for those who live jet-set lifestyles. Of course, the higher you go in the luxury card niche, the more the extravagance of the rewards. The Black Card compares to the American Express Platinum Card. 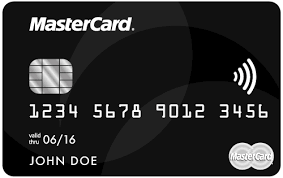 To get hold of a Master Black Card, you just apply online, like you would for any credit card. However, you need outstanding credit to get it. And there’s the $495 annual fee plus $195 for any additional authorised user on this prestigious card. Mastercard Black Card has been featured as a premier high-end credit card in the Vegas Magazine, Capitol File, Ocean Drive and LA Confidential. Do you have what it takes to own this small piece of magical stainless steel? ← The VISA Black Card requires quite a Formidable bank Account. Are you up to it?